The Real Madrid Stadium Large Pennant is a hangable design and is perfect for hanging on any Real Madrid fan’s wall. 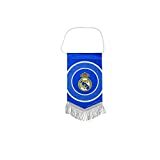 This Real Madrid pennant is in club colours, features the world famous Real Madrid stadium, revelling players along with the teams crest, making it an ideal gift. The pennant measures approximately 110cm x 48cm, made from 100% Polyester and has a matching string at the top for hanging. This Pennant is an official Real Madrid product and is produced under licence for Real Madrid FC.